By 2020 Nevada officials say they will be ready for a coup de gras in the decades long struggle to clean up the remains of southern Nevada’s industrial past. Volatile chemicals have been leaching into Nevada ground water since the 40s but residents are not in danger. Levels in drinking water are at undetectable levels officials say. NERT Officials say study, clean up Proceeding Well. Once upon a time the waste from rocket fuel manufacturing was dumped into unsealed dirt ponds in the Henderson are where it seeped into the ground water for decades. “It is not in the drinking water,” said James Dotchin supervisor for the Special Projects branch of the state agency assigned to supervise the clean up at a public meeting in Henderson on Wednesday. A metal called Chromium and a chemical called ammonium per chlorate are in the ground water at rates of 1 to 10 parts per million downhill from the site of the pollution and thousands per million at the site but residents of Henderson but are not at risk. In answer to a resident’s question he added that contamination at the source of the pollution the old Black Mountain Industrial complex is in the thousands of parts per million in the ground water but has not infiltrated surrounding soil or drinking water. Perchlorate is a group of oxidizers used in rocket fuel, fireworks, and military ordinance. He said the ground water would not effect vegetable gardens or family pets but potential home owners would have to be informed. Dotchin detailed the history of the pollution to the audience of three dozen or so residents. The pollution comes from the old Kerr McGee plant now called Tronox and several other now defunct plants operating in southern Nevada since the 1940s. Perchlorate poisoning can cause thyroid problems and chromium can cause dermatitis and some forms may be carcinogenic according to the Environmental Protection Agency website. There are currently no EPA standards for per chlorate in drinking water Dotchin said but the agency is working on it and the state of Nevada sets the standard at 18 parts per billion. Current levels in southern Nevada drinking water are at non detectable levels he said. 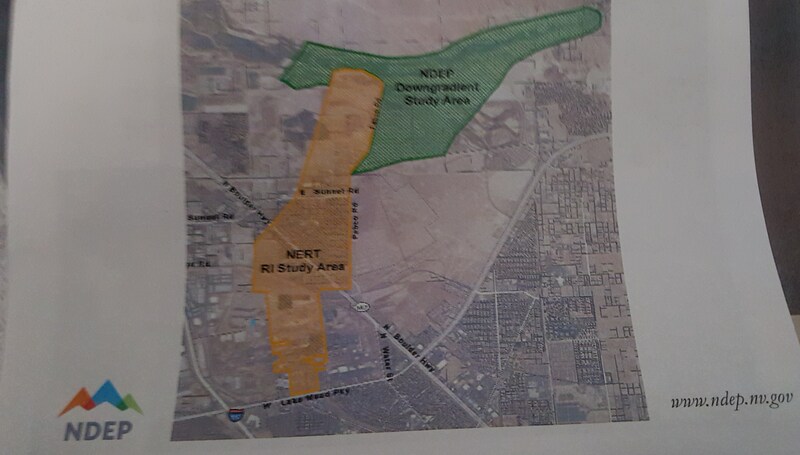 The study currently underway in the down gradient area north of the complex an east/west strip of land that includes the area around Sam Boyd Silver Bowl is being conducted by the Nevada Environmental Response Trust. This group formed around the bankrupt Tronox company formerly Kerr McGee company. Effforts to clean up the BMI complex a 346 acre complex contained in a long north/south strip of land roughly east of Pecos and north of Lake Mead Parkway have been going on for decades and includes several ground water capture sights through the county. Chemicals produced there include elemental boron, boron trichloride and boron tribromide manganese dioxide, and ammonium per chlorate.